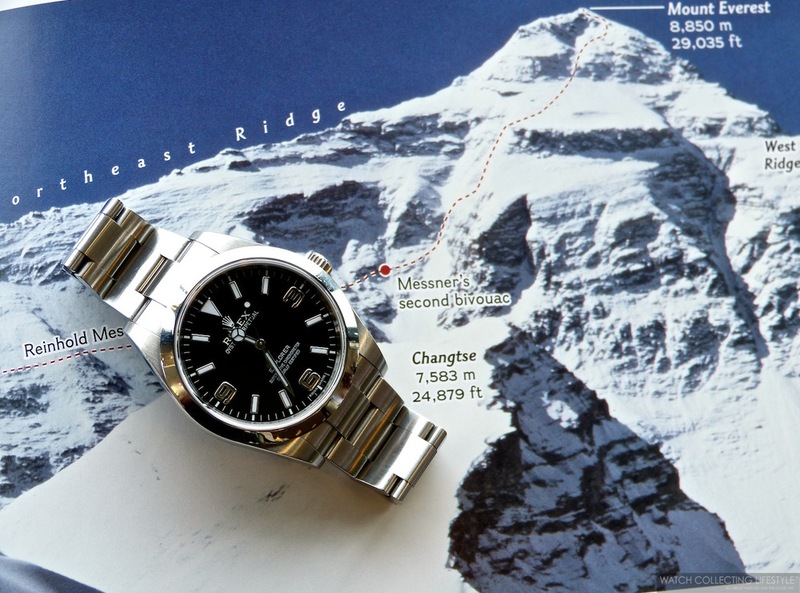 Insider: Rolex Explorer ref. 214270. Commemorating 60 Years of the Conquest of Mount Everest. May 29th, 2013 marks the 60th Anniversary of the conquest of Mount Everest. Mount Everest is the tallest peak on earth at 8,850 m —29,035 ft— located in the heart of the Himalayas between the borders of China and Nepal. Before Sir Edmund Hillary and Tenzing Norgay successfully reached the summit, two other expeditions got quite close. In 1924, George Leigh Mallory and Andrew 'Sandy' Irvine were last seen at the Second Step at about 28,140-28,300 ft of altitude. Many people still wonder if they might have been the first ones to make it to the top; however, since neither one made it back, we'll never know for sure. After seven weeks of climbing, the first two climbers to ever reach the summit of Mount Everest were the New Zealander Sir Edmund Hillary and the Nepalese Sherpa Tenzing Norgay —both members of a British expedition led by Colonel John Hunt. At 11:30am on May 29, 1953, these two man reached the summit in company of a few timepieces. Opposed to what most people think, the watch worn by Sir Edmund Hillary during the ascent was not a Rolex but a Smiths watch. Today, it's still unclear whether the Rolex Explorer prototype he was given was a ref. 6098 or a ref. 6084—like the one pictured below. What we know for sure, is that the Rolex watch was kept in his pocket during the ascent and taken out until the summit was reached. On the other hand, Sherpa Tenzing Norgay was indeed wearing a Rolex watch at the time he reached the summit —a gold bubble-back ref. 6305 given to him by Swiss climber Raymond Lambert. Rolex ref. 6084. Image from Christie's. Rolex ref. 6305. Image from Christie's. Regardless of which watch made it to the top first, we will always correlate the Rolex Explorer to that memorable event in mankind. After the expedition, Rolex Bosecks Calcutta gave Sir Edmund Hillary an engraved Rolex Explorer prototype just like the one that was issued for the expedition and Rolex Watch Company presented Tenzing Norgay an engraved gold Datejust ref. 6305 as a memento of the Swiss Expedition to Mount Everest. Later during the year 1953, the first Explorer to have the recognizable dial with Arabic numerals at 9, 6 and 3 was launched under ref. 6298. Since then, the Explorer has seen different dial configurations and case changes including: the first dial to include the word 'Explorer' ref. 6350, a dial with red depth rating known as ref. 6610, an Explorer fitted with a white seconds hand ref. 6610, an Explorer with white seconds hand and the words 'Explorer' and 'Super Precision' in white lettering ref. 5504, a rail dial on ref. 5500, the Space-Dweller launched in 1963 ref. 1016 and lastly the latest version —pictured below and presented in 2010— with a larger case measuring 39mm and font changes ref. 214270. Without a doubt, the Rolex Explorer is a robust watch well suited for climbers and for any watchlifestyler in pursue of discovering the remote confines of planet earth. This watch is not only a classic, but a discreet timepiece that will take on daily abuse just like any other Rolex. Fitted with a sleek black dial, a reliable automatic movement —calibre 3132 with a power reserve of 42 hours— and a very comfortable 39 mm case with an oyster bracelet, the Rolex Explorer is the perfect companion for watchlifestylers seeking adventure. Sticker price $6,550. Images used on the background courtesy of ©Andy Bardon, ©Kristoffer Erickson, ©Royal Geographical Society and ©National Geographic Magazine. National Geographic Society The Call of Everest: The History, Science and Future of the World's Tallest Peak by Conrad Anker, 2013. Posted on May 29, 2013 by Editor & Publisher and filed under Rolex and tagged Rolex Explorer Rolex Explorer ref. 6298 Rolex ref. 6084 Rolex ref. 6305 Rolex Explorer ref. 1016 Sir Edmund Hillary Sherpa Tenzing Norgay Mount Everest John Hunt Rolex Explorer ref. 214270.